Chlorine is used in swimming pools as a sanitizing agent to disinfect swimming pools, and an oxidizer to help remove contaminates from the pool water. What is Chlorine for swimming pools? Chlorine is a versatile chemical, known for its ability to readily combine with other substances in an aqueous (water) solution to form many different chemicals. Chlorine in water breaks down to form chemicals like hypochlorous acid and hypochlorite ion. Several chemical processes result in active chlorine compounds becoming degraded: oxidation of organic materials, chlorine compounds combining with other elements rendering them ineffective, and exposure to ultraviolet (UV) rays from the sun. As a result, the breakdown of chlorine requires the constant addition of new chlorine to swimming pool water to maintain adequate chlorine levels. Chlorine compounds in swimming pool water have a sanitizing and disinfecting property, enabling the compounds to kill microorganisms like bacteria found in swimming pool water. This is possible as the chlorine compounds formed disrupt the microorganism cell wall lipids, destroying them through oxidation. The disinfecting property in chlorine is very effective because both chlorine compounds formed have different speeds of oxidation, overwhelming any defenses the microorganism might have. Keeping the pool sanitized will prevent the growth of unwanted microorganisms. Some of these microorganisms are harmless, but some can make people sick, so it is important to maintain adequate chlorine levels. 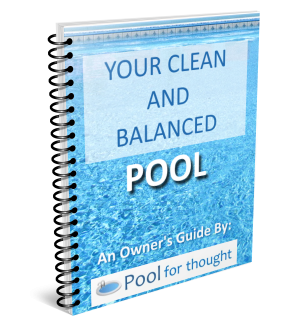 Chlorine serves another purpose – to oxidize organic material present in the pool. Organics can mean just about anything that ends up in a pool, from wind and rain depositing dust and debris into the pool, to the organic material given off naturally by swimmers. Lotions, bodily fluids, skin cells, hair, and any chemicals present on the skin, clothing, or pool toys can all be sources of organic materials. The result of this oxidation is improved water clarity, giving the pool water an inviting sparkling quality.